The VideoMic Pro Shotgun Microphone and Windbuster Kit from B&H includes the Rode VideoMic Pro Shotgun Mic and a Windbuster windscreen. The VideoMic Pro is designed to capture DSLR and camcorder audio. It has a 3.5mm output that allows you to plug directly into your camera or digital recorder. It has a built-in high-pass filter at 80Hz and a 3-step level control. The Windbuster windscreen is custom fit for the VideoMic Pro and provides up to 30 to 40dB of wind noise reduction. VideoMic Pro Shotgun Microphone and Windbuster Kit is rated 4.7 out of 5 by 15. Rated 5 out of 5 by Craig from Good Shotgun for Blackmagic Blackmagic Pocket Cinema Camera needs the gain switch on this mic for good internal recording. Windbuster helps for outdoor windy use. Keeps the camera small and discreet. Rated 5 out of 5 by ED299 from Great mic at a fair price. This has proven to be a great lightweight mic, especially with the wind cover on. With its light weight & small size I just put it on as soon as I get the camera out and it never seems obtrusive. In situations where my onboard mics on the C100 II and the 70D are useless this little mic has come through repeatedly despite windy/gusty conditions. Obviously it too will be defeated by strong wind but it holds up well enough most of the time. Battery installation is a bit awkward but the battery life is long enough that it's a non issue. Don't know how well the shock mount elastics will hold up in the long term but it came with a replacement set and I haven't needed them so far (nearly one year). When the mic is stowed at the end of a shoot it lives loose on top of other equipment in my bag - the wind cover (aka dead cat) stays on and protects the mic from my other gear. My one minor criticism is that the elastic that holds the dead cat (wind cover) on tends to ride up and over the switches on the back of the mic. It's pretty trivial though and hasn't caused any problems or come off. The recording quality from this mic is excellent. For a small light package and a reasonable price (IMO) this has become a must have part of my shooting setup. Definitely recommended, especially on DSLRs where the size and weight don't attract attention or affect the balance of the rig. Rated 5 out of 5 by Eric Elizalde from Great shotgun mic for skateboarding! I enjoy this mic alot! Great audio, easy to use and the windbuster kit helps for those windy days. I think the only down side to this was putting on the 9v battery, it is a bit difficult to put into the slot, but overall a great mic. 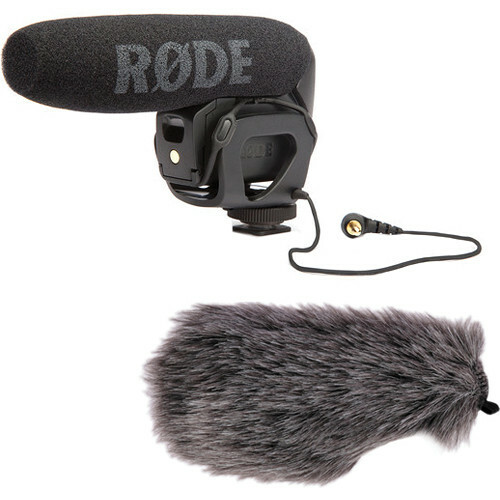 For any skateboard filmer on a budget who is looking for a shotgun mic with great audio and also a fuzzy mic cover, I'd HIGHLY recommend this mic kit. Rated 5 out of 5 by Nate from This is a great microphone With a built in pre amp and hours of battery life. This will be a reliable addition to your arsenal if you dont have a microphone yet. Rated 4 out of 5 by Nathaniel Peters from Good sound in a pinch! I am an amateur director who needed an upgrade over the built in camera microphone. After a considerable amount of research, the videomic pro seemed to be the best option for the price. It certainly doesn't produce perfect sound, but it is a big upgrade over the built in microphone on the camera. I'm currently using it plugged directly into a Canon T4i. There is a little noise, but voices come through warm and clear. There's not much tin, though it does still pick up a considerable amount of echo in small, hard surfaced rooms. The windbuster is a little tricky to put on, but seems to work very well. I've only briefly tested this feature, and will update this review if I notice anything either spectacularly good or bad. Overall, it's a good, simple solution for in-camera audio. I put four stars because it's a *little* expensive for the sound quality delivered, but that's more in line with a pet peeve than an actual complaint. Rated 5 out of 5 by Jedhess from Great all around microphone Works well and battery lasts surprisingly long. I got 3 weeks of off and on use. I was pleasantly impressed at how well it did when shooting a concert. It has a tendanxy to gain to high during interviews but that is a problem with my camera not the mic. Rated 5 out of 5 by Andrew K from Good mic The VideoMic Pro is a solid on-camera mic. I use it on my C100 when I'm trying to stay lightweight. It has served as my primary mic in a few situations and a backup in many. Great bang for your buck. The wind buster works well too. Rated 5 out of 5 by Bill from Great Mic Almost all my video is shot outdoors. This mic cuts out a lot of wind noise. Can I get an extension cord to use this with a boom pole? If so, where can I buy the cord? Yes, you can use any standard 1/8 sized extension cord available at any electronics store and probably also from B &amp; H.
Does this work with the Sony A7R? Sure will - plug and play. Can I use this for my Cannon Rebel dslr? The VideoMic Pro is compatible with DSLR cameras that feature a 3.5mm mic input jack. Not all Rebel cameras feature this mic input, please check your camera or your manual for connections available on your particular camera. The Rode VideoMic Pro is compatible with the Sony HDR-XR550E. It will connect to the cameras external mic input. In order to mount the mic you will require an additional bracket as the Sony and most similar camcorders do not featurea standard size accessory shoe. The Vello CB-510 is a recommended solution. Will this fit on a Panasonic GH3? Asked by: Milton Anthony C.
Yes, it is compatible, 3.5 mil input and hot shoe are all you need on the camera. my rode mic pro shock mount broke. I can't seem to find replacement shock mounts. Does anyone have a replacement part number? Does this work with cannon 5d Mark 2 camera? B &amp; H has a pattern of systematic racism; this issue can be perfectly discussed with the Rode VideoMic. Wondering what the difference is between this kit, which is priced at $208, and the solo Videomic Pro mic (&lt;a href= http://www.bhphotovideo.com/c/product/744768-REG/Rode_VIDEOMIC_PRO_VideoMic_Pro_Compact_Shotgun.html target= _blank &gt;http://www.bhphotovideo.com/c/product/744768-REG/Rode_VIDEOMIC_PRO_VideoMic_Pro_Compact_Shotgun.html&lt;/a&gt;), which is $6 more at $214, but seems to come with less? That's exactly the same mics. So go with this one, it's cheaper and you have a windscreen. The windscreen is a cheap aftermarket product, but it do the job.